A friend of mine in Malaysia told me about a parang that was so strong it could cut through 6 inch nails with a single swipe and without going blunt… it was, he told me, sold as a blank blade (without handle) and could only be found at certain night markets (and only then if your luck was in). I was immediately hooked by the idea of this ‘Excalibur’ amongst parangs and resolved to find it myself. I never did come across this mythical machete and, truth be told, have become increasingly skeptical of its magical powers and have begun to doubt its very existence. …but a part me hopes it does exist. I imagine there are many of us who are interested in bushcraft who have, at one time or another, spent too much on a knife and then had to justify (or lie about the cost) to our very disapproving partners. I know I have. We rationalize that a tool we use so much should be the best there is and that the measure of which is ‘best’ is the cost or, maybe, an endorsement from some TV celebrity. Deep down we know this isn’t necessarily true – take a look at Mora knives (excellent value for money) vs, say, a John Wiseman Survival knife (so expensive that any truly wise man wouldn’t buy it). As far as parangs go, my recommendation is to buy one when you arrive (cost about 4 pounds), and in the video below I show a few alternatives and why my preference would be to buy a local one… and buying when you arrive has the added advantage that you don’t have to take your machete with you to the airport! Local parangs do have their problems and there are a few different types out there; so you need to be aware that some are better than others (I’ll cover all this in the next post) but in terms of value for money they are hard to beat. …so, until I stumble across Excalibur, I’ll happily settle for my local parang. Why is it that an axe and bushcraft knife are right for a temperate forest but a parang is preferred for the jungle? The main reason is that the jungle (particularly secondary forests) will present an array of super sharp plants/vines/rattans etc that will do their very best to slow you down, block your path and generally annoy the hell out of you… and nothing is better for clearing them out of the way than a parang. In the video below I review a few knives and the reasons you might want to take one in with you… but only in addition to your parang; because a parang can do everything a knife can do, but a knife can’t do what a parang can. Your trip to the jungle begins back at home, when you choose what to take with you. Naturally this will depend on the type of trip you have in mind – equipment for a 2 week foray into the heart of the jungle will be different from that needed on a one day hike on a well maintained trail. 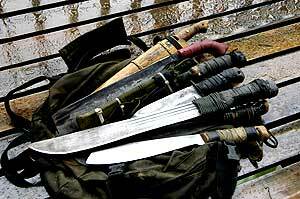 However there are some items that you should always carry with you – what is often referred to by various acronyms like ETC (Every Time Carry), EDC (Every Day Carry) – and first and foremost among these items is your parang (the Malay name for a machete). It is difficult to overstate the importance of a parang when you are in the jungle. With it you can clear a path, find water and food, make fire and shelter…in fact with a parang and good junglecraft you could survive in the jungle for as long as you like. In short, going into the jungle without a parang is like going to the artic and forgetting to take a warm coat. You just don’t do it. If you haven’t been into the jungle before, you’ll want to know which parang to get (and where to get it), how to sharpen it and how to use it properly. Over the next few days, I’ll post a series of articles covering these areas. The good news is that none of it is rocket-science and a good parang isn’t expensive.